Microsoft Office 2013: What’s Changed? The latest version of Microsoft Office is coming soon, and many of you may be wondering what changes to expect. How is it different from Office 2010? And what is Office 365? If you have those questions, read on. Here’s a brief understanding of the different options. One of the first things you’ll notice about Office 2013 is a refreshed interface. The new look falls in line with the “Modern” interface of Windows 8, featuring a minimalistic appearance that PCWorld suggests will be less of a distraction to users. You’ll see a much more touch-friendly version, allowing you to scroll through items by swiping your finger across the screen. And you can switch to a traditional navigation when you’re using a desktop without a touchscreen monitor. SkyDrive and SharePoint have been integrated for you to more easily access documents stored online from any location. PDF Editing is another new feature of Office 2013. PDF files can be opened and edited in Word 2013, and then saved as either DocX files or as PDFs. Excel 2013 has the ability to support multiple monitors, unlike Excel 2010. While the Ribbon hasn’t changed too much in functionality, its appearance in Office 2013 has changed slightly. Information Week describes it as being flatter than the 2010 version of the Ribbon. Office 2013 also includes an option to make it more compatible with touchscreens for tablet use. While Office 2010 and 2013 must be installed onto a desktop or laptop computer, Office 365 is an online service to which users must subscribe. Instead of purchasing boxed copies or online downloads, users can purchase an Office 365 subscription which provides all the core Office applications, as well as email, shared calendars, public websites for businesses, and internal sites for teams. Those with Office 2010 already installed on their computer can configure the program to work with Office 365 and have the ability to retrieve, edit and save Office documents in the Office 365 cloud. Users can also complete tasks such as co-authoring documents in real-time or begin PC-to-PC calls. Office 365 is compatible with Office 2007 and newer versions. To learn more about what’s coming in Office 2013, register for our webinar on November 13 for a demonstration of major new features within each application. Visit our website or contact us for more information. 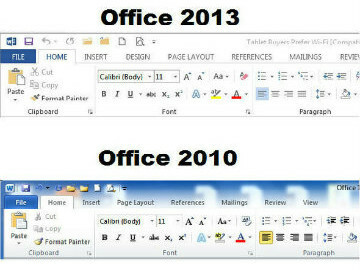 There is one element of Office 2013 I am disappointed in compared to 2010 and 2007: The visual interface! I was very surprised to see that the interface was very plain. The previous versions are so much better as far as this because they are so much more colorful and attractive than 2013. In my opinion, the fact of having a more colorful interface alone attracts more people to learn and use it. Agreed. 2013 is like 2012 sucked dry and left to die. I had used both of MS office 2010 & 2013 and MS 2010 is much better and easy to use and handle. Thanks! I personally don’t like the flat interface but I may grow to like it asI prefer ios 7 now i’m used to it. It takes longer to scan the icons as I have trained my brain to look out for the old styling of icons. Same happened with Windows Vista when they changed all the icons I knew from XP. I great that they have improved touch usability but havn’t tried it on touch interface. One good thing is that they are unifying the Windows, Mac OS X, iOS and web interfaces of Office. I am working on my certification in Office and was going to certify in 2010 and2013 but the interface is so challenging. It is hard to work in and see as I have vision issues anyway. I am going to abandon the cert on 2013. I hope Microsoft wises up and returns to the 2012 format. Color is not distracting it is inviting. Please Microsoft give us back the life.